Legendary heavy metal band Candlemass, purveyors of all things doom, arrive in 2009 with 'Death Magic Doom,' an astonishing work of satisfying heavy metal. Although known mostly for their traditional doom elements from the beginning, 'Death Magic Doom' takes a higher, more interesting road, with greater dose of classic melodic heavy metal. For this metal fan, who can take or leave much doom metal with easy ambivalence, this characteristic made this work much more appealing and therefore satisfying. However, Candlemass fans, and doom metal fans in general, should not fret one bit over this trend: it's not overwhelming and the core element of doom metal still remains woven into each song. Actually, the songs 'The Bleeding Baroness,' 'Dead Angel' and 'Clouds' weigh heavier on the doom and gloom side, but are not oppressively so. Even in a song like 'The Bleeding Baroness,' the pace excels near the end to sound more like classic metal. The real goods are found on 'Hammer Of Doom' which lives up to its title perfectly. Yet, tracks like 'If I Ever Die' or 'House Of Thousand Voices' could easily pass for basic melodic metal or sometimes power metal, as in the former. Or Candlemass can offer a two-sided coin with 'My Funeral Doom' which has a pure doom-laden arrangement in the first and then near melodic power metal finish in the second half. Finally, what really powers 'Death Magic Doom,' and truly caught my attention, is Robert Lowe's immaculate vocal performance and Lars Johansson fiery guitar presence. 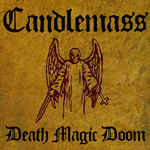 'Death Magic Doom' is everything you would expect from Candlemass: straight up traditional doom metal with a deep, foreboding sound, glooming lyrics and awesome fret work. Candlemass's legendary status is well-deserved.